Interactive performance developed by the League, with movement by paige starling sorvillo of dance company Blindsight and sound by George Cremaschi and live drawing by Misato Suzuki and Anne Chao. 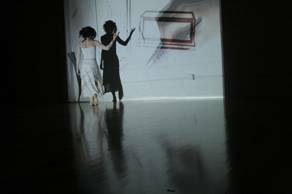 Eating words and swallowing clouds, starling sorvillo brings her lexicon of animated gestures and expressions to contemporary Butoh. Overlaid with scientific data, the live interaction relays the political and physical anatomy of consumption. 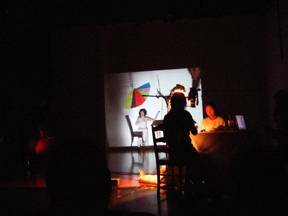 “Live Diagram” is an interactive performance examining the connection between thought and action while figuring the digestion of the world. 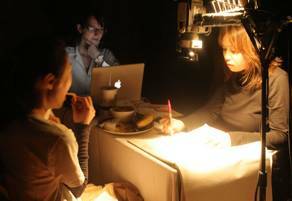 The piece is a collaboration between the League of Imaginary Scientists and blindsight and explores layered themes economic and biological consumption. Eating words and swallowing clouds, starling sorvillo brings her lexicon of animated gestures and expressions to the interactive performance. Overlaid with scientific data, the live interaction relays the political and physical anatomy of consumption.